What if when we break “out there,” we will find out that we really are alone? In the “Empire of Man” stories by Jerry Pournelle, this is exactly what happens. The human empire, out amongst the stars thanks to the Alderson Drive, does find life in various planets, even complex animal life, but no intelligent life. In other words, there is nobody for us to talk with. Then, suddenly, in 3017 AD, the Moties are discovered, as a single slower-than-light ship arrives, after over a century of travel, from their system -- The Mote -- to the New Caledonia system. Will they be friendly? Will they be nice? Clearly, they have no faster-than-light travel, but perhaps they do have other technologies or cultural riches that can benefit mankind? The Motie was an intelligent toolmaker. It had traveled across thirty-five light years to find human civilization. And Rod Blaine had killed it. A military and scientific team is hastily assembled and sent to the Mote system. The Moties are discovered as intelligent, friendly, and talkative; their technology, in particular, is far more advanced than humankind’s. It is purely by chance that they were not able to leave their system so far: they did discover the physics that led to the development of the Alderson Drive (which they call the Crazy Eddie drive). But none of the ships they’ve sent through the Alderson Point (err, Crazy Eddie point) in their system ever returned. The humans know that this happens because the Point in the Mote system leads directly into the edge of a nearby star; no human ship could have made the trip without the protective Langston Field, but the Moties apparently never discovered that field. Except that they hold a terrible secret. 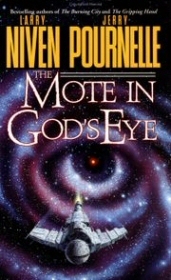 The Mote in God’s Eye was Niven and Pournelle’s first collaboration, and a wildly successful one. Although each of the authors has his own unique style, they make out an excellent pair (as also evident in later books, such as Lucifer’s Hammer). No previous familiarity with Pournelle’s Empire of Man universe is assumed in this book, which in fact outshines any other work that takes place in the same universe.